“Whatever else happens, life lives.” These words, from a poem by Detroit’s Poet Laureate Naomi Long Madgett, reflect the strength and determination of a woman singular in her approach to life and language. A gifted poet, publisher, educator and mentor, Madgett is one of Detroit’s living legends. With brave conviction, she created a life for herself and stimulus for countless writers as she embarked, as a teenager, on a writer’s life. 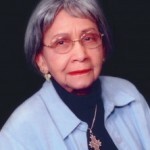 In the mid-20th century, she helped established a voice for African American females in a world where they were not yet heard. She founded the Lotus Press in 1972 to champion the literary accomplishments of under-recognized writers. And, her pioneering efforts for fairer representation of literature by African Americans in high school and college textbooks inspired the Detroit Public Schools to make her book, Octavia and Other Poems, required reading in all public high schools in Detroit. Today she remains a literary heroine, and her influence is immeasurable. It is because of her achievements, service and commitment that Kresge Arts in Detroit is honored to present the 2012 Kresge Eminent Artist Award to Naomi Long Madgett. Since 2008, Kresge Arts in Detroit has each year honored an exceptional artist in the literary, performing or visual arts for lifelong professional achievements and contributions to the cultural community of metropolitan Detroit. The Kresge Eminent Artist Award, administered for The Kresge Foundation by the College for Creative Studies, includes a $50,000 award that acknowledges artistic innovation, integrity and depth of vision. Nominations for the award are made by the Kresge Arts in Detroit Advisory Council, a volunteer group of leaders in the metropolitan Detroit cultural community who provide external oversight to the program. Madgett was selected by an interdisciplinary panel of five distinguished members of Detroit’s artistic community: Larry Gabriel, writer and musician; James E. Hart, musician and educator; Rebecca Mazzei, Deputy Director of Museum of Contemporary Art Detroit; Robin Terry, Chairman and Executive Director of the Motown Historical Museum; and Marilyn Wheaton, Director of Marshall M. Fredericks Sculpture Museum. We are grateful to this group for carrying out this important responsibility, selecting Madgett from among a number of highly influential nominees. Like the Eminent Artists before her – Charles McGee, Marcus Belgrave and Bill Harris – Naomi is a leader in her field and, lucky for us, has chosen to make Detroit her home. She continues to animate Detroit’s cultural life with tender poems, the resolute Lotus Press, and a legacy of teaching that has brought forth generations of talented writers. All of these accomplishments and more have elevated Naomi to a status which is truly eminent.